For your Super Bowl party this weekend, try our healthier version of deep-fried chicken fingers. These lightened-up, baked almond-crusted chicken tenders are flavorful, crunchy and a definite crowd pleaser (you don’t even have to let on that they are better for you). Nuts like almonds contain heart-healthy unsaturated fats, fiber and vitamin E, and are known for their antioxidant properties. 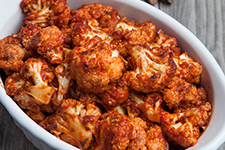 Pair with veggies and Greek yogurt-based dips for a healthy, delicious super snack spread. Pulse almonds in a food processor until finely ground into an almond meal. Mix the almond meal together with garlic, paprika, dried mustard, oregano, thyme, salt and pepper. Dredge each piece of chicken in egg and coat with almond spice mixture. Place pieces on lightly greased cookie sheet. Makes 8 servings (about 2-3 tenders per serving). Per Serving: 220 calories, 10 g total fat (1.5 g saturated fat), 4 g carbohydrate, 2 g dietary fiber, 28 g protein, 430 mg sodium. In a medium bowl, stir together all ingredients, except for garnish. Garnish with fresh chives and serve chilled. Makes 8 (2 Tbsp.) servings. Per Serving: 25 calories, 0 g total fat (0 g saturated fat), 3 g carbohydrate, 0 g dietary fiber, 3 g protein, 180 mg sodium. Makes 8 (1 Tbsp.) servings. Per Serving: 20 calories, 0 g total fat (0 g saturated fat), 3 g carbohydrate, 0 g dietary fiber, 1 g protein, 150 mg sodium. Author: Sonja Goedkoop, MSPH, RD, is the Manager of Nutrition and Wellness at Zesty, Inc. She is passionate about helping others improve their health through diet and physical activity and believes eating nutritious food should be easy and taste great. You can follow her on Twitter @SonjaGoedkoopRD.